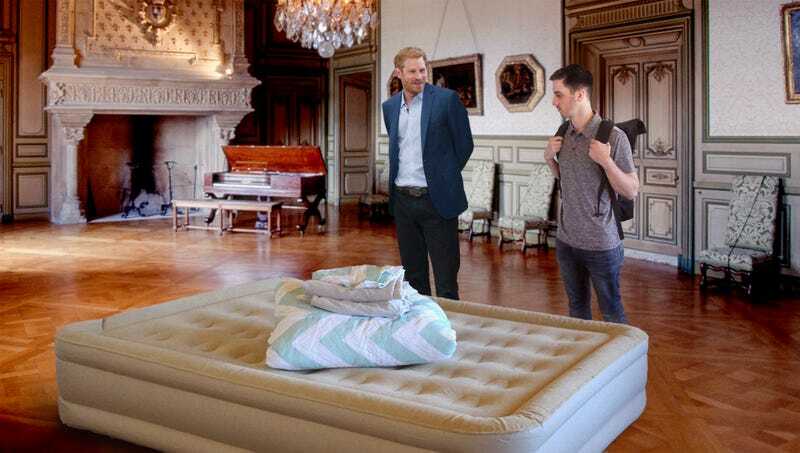 WINDSOR, ENGLAND—Ensuring his college friend had a comfortable place to crash while in town for the upcoming wedding, Prince Harry led guest Arnold Hayweather to an air mattress in an unused side room at Windsor Castle. “Ah, here we are. I inflated the old boy pretty good, so feel free to let some air out if it’s too firm, but keep in mind it’ll probably deflate a bit overnight,” the soon-to-be-wed Prince told his guest, handing him a single faded towel and adding that the closest bathroom could be found in the stables nearest the George IV gateway on the far side of the 13-acre estate grounds. “I’ll give your name to the Queen’s Guards, they shouldn’t bother you in the least. There’s no password on the WiFi, and, oh, yes—if you wouldn’t mind just tucking your suitcase and stuff against the wall during the daytime? The tours come through to see this portrait of the Earl of Shaftesbury. Thanks awfully for coming. We’re so glad you could make it.” Harry later sent a courier with a note to inform Hayweather that if he found his current spot got too much sunlight, he should feel free to move the mattress to the crypt beneath St. George’s Chapel.